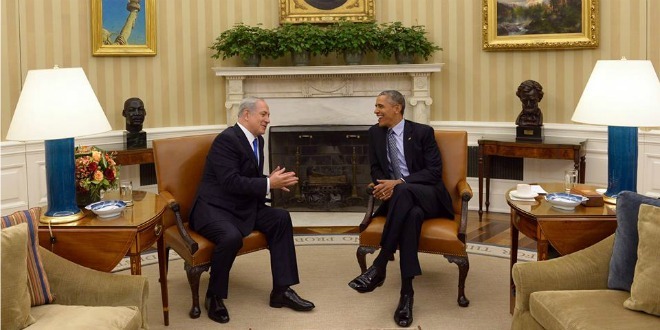 Minister Netanyahu meets with President Obama about the security of Israel. President Obama says that Israel’s security is a primary focus of his administration and he’s committed to using the resources of the United States to help keep Israel safe. As I’ve said repeatedly, the security of Israel is one of my top foreign policy priorities and that has expressed itself not only in words but in deeds. We have closer military intelligence cooperation than any two administrations in history. The military assistance that we provide we consider not only an important part of our obligation to the security of the state of Israel but also an important part of US security infrastructure in the region as we make sure that one of our closest allies can not only protect itself but can also work with us in deterring terrorism and other security threats. Prime Minister Netanyahu also expresses his appreciation of the strong bond that exists between the United States and Israel. We’re with each other in more ways than one and I want to thank you for this opportunity to strengthen our friendship which is strong and strengthen our alliance which is strong. Netanyahu rejects calls by Mahmoud Abbas and opposition leader Isaac Herzog to let more Syrian refugees enter Israel, and says that a 30-kilometre fence will be constructed across the Jordan border. We will not allow Israel to be submerged by a wave of illegal migrants and terrorist activists. Israel is not indifferent to the human tragedy of Syrian and African refugees… but Israel is a small country — very small — without demographic or geographic depth. That is why we must control our borders. 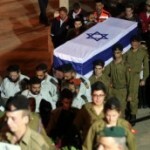 The State of Israel takes a strong line against terrorism regardless of who the perpetrators are. The Government of Israel is united in its strong opposition to such deplorable and awful acts. Prime Minister Netanyahu continues to verbally oppose the Iran Nuclear Agreement. He states that as the leader of the only Jewish state, he feels it is his duty to make sure that state remains protected and safe against current and potential future danger. I have great respect for our intelligence services, they’re the best in the world, Israel’s, the U.S. And UK. Yet, all of three of us didn’t see for a long time the nuclear bunkers, we didn’t see the Syrian work on a nuclear reactor that was almost operational when we discovered it. Israel is releases a statement about the Vatican’s treaty recognizing Palestine as a State. This move does not promote the peace process and distances the Palestinian leadership from returning to direct and bilateral negotiations. Israel will study the agreement and will consider its steps accordingly. Walker makes a trip to Israel. On the trip he meets Israeli PM Netanyahu. He also visits major historical and religious site. 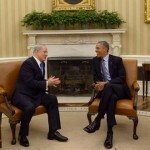 Netanyahu tells Obama that Israel opposes the nuclear framework agreement with Iran. A deal that is based on this framework will threaten Israel’s existence… The alternative is to stand firmly and increase pressure on Iran until a better deal is reached. Netanyahu apologizes to Israel’s Arabic citizens for remarks which offended members of the community. I know that my comments last week offended some Israeli citizens and offended members of the Israeli-Arab community. This was never my intent. I apologize for this. In an interview with AM 970 on The Cats Roundtable, McLaughlin says that President Obama’s role during the Israeli elections was bigger than has been reported. He noted that the effort to oust Netanyahu was led by a former Obama political operative and that V15 is linked to the Washington-based nonprofit OneVoice Movement, which reportedly received $350,000 in State Department grants. What was not well reported in the American media is that President Obama and his allies were playing in the election to defeat Prime Minister Netanyahu…There was money moving that included taxpayer U.S. dollars, through non-profit organizations. And there were various liberal groups in the United States that were raising millions to fund a campaign called V15 against Prime Minister Netanyahu. The State Department people in the end of January, early February, expedited visas for [Israeli] Arab leaders to come to the United States to learn how to vote…There were people in the United States that were organizing them to vote in one party so they would help the left-of-center candidate, Herzog, that the Obama administration favored. 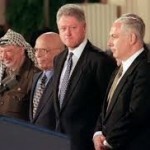 The United States will re-evaluate our approach to the Israeli-Palestinian conflict. It has been the longstanding policy of the United States that a two-state solution is the best way to address this conflict. The president still holds that view. [Netanyahu’s statement] undermines the values of democratic ideals that have been important to our democracy and an important part of what binds the United States and Israel together. He says that he warned the U.S. ahead of time not to trust Hamas to stick to ceasefire conditions, after a three-day truce agreement breaks down within two hours as Hamas militants are said to abduct an Israel Defense Forces soldier on a tunnel operation and the IDF responds with tank shells. 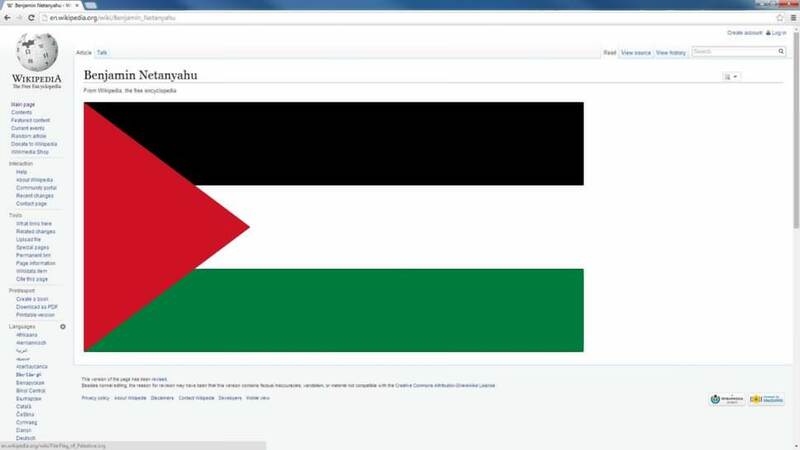 Wikipedia user TSKAero1 replaces the biographical information on Netanyahu’s Wikipedia page with a Palestinian flag in apparent vandalism related to the 2014 Gaza conflict. Editors revert the article to a previous iteration within about 40 minutes, removing the changes. Netanyahu tells Blitzer that Hamas has used tens of thousands of tons of concrete, which could have gone towards building other facilities for the community such as schools, into tunnels to attack Israel instead. You know what they did with that, Wolf? They put 700 tons of concrete into each one of these terror attack tunnels to penetrate Israel. Now, we have discovered dozens of them. So you’re talking about tens of thousands of tons of concrete, instead of going for the benefit of the school, the population, is going for terrorism against Israel. I think it – I think the international community has to – once this is put in place, we really have to undertake a program to demilitarize Gaza and to change the situation, because it’s unacceptable. What makes it unacceptable is Hamas and Islamic Jihad. 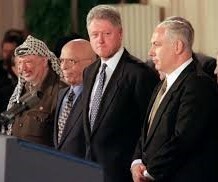 These people are the worst terrorists, genocidal terrorists. They call for the destruction of Israel, and they call for the killing of every Jew wherever they can find them. What choice do we have? We have to protect ourselves. So we try to target the rocketeers. We do. And all civilian casualties are unintended by us, but intended by Hamas. They want to pile up as many civilian dead as they can, because somebody said they use – it’s gruesome. They use telegenically dead Palestinians for their cause. They want the more dead the better. I support taking whatever action is necessary to stop this insane situation…Just imagine – I mean, imagine what Israel is going through. Imagine that 75 percent of the U.S. population is under rocket fire and they have to be in bomb shelters within 60 to 90 seconds. So, I’m not just talking about New York – New York, Washington, Chicago, Detroit, San Francisco, Miami, you name it. That’s impossible. You can’t live like that. So I think we have to bring back, restore back a reasonable, sustained quiet and security. And we will take whatever action is necessary to achieve that. Nobody wants to go to excessive military plans, but what is happening here is excessive. Netanyahu says that Israel doesn’t ‘obliterate’ Palestinian civilians and has no battle with anyone other than Hamas, but that the brutality results from Hamas’ tendency to place rocket launchers near civilian targets – a tactic which he says is intentional. People would say in the United States, as they’re telling me, obliterate the people. We don’t obliterate them. 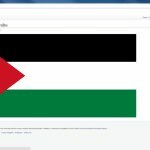 We don’t want to – we don’t have any battle with the Palestinians in Gaza. I appreciate the support we have received from President Obama and many world leaders for Israel’s right to self-defense. But others are saying, yes, you have the right of self-defense, as long as you don’t exercise it. What can a country do? What would you do? What would the people of the United States do if – if your cities were rocketed now, 2,000 rockets falling in American cities? We develop anti-missile systems to protect. We use an anti-missile system to protect our civilians. They use their civilians to protect their missiles. That’s the difference. So, against such a cynical, brutal, heartless enemy, we try to minimize civilian casualties. I mean, the Hamas leaders are divided into two. Those who are under – in underground bunkers in Gaza, they don’t care. Let the people there, you know, with the rocketeers and with the attack tunnels, let them die as Israel tries to surgically take them out. But they’re safe underground, the military leaders. And then they have got the political leader, this guy Khaled Meshaal, who is roaming around five-star hotel suites in the Gulf states, having the time of his life, while his people, while he’s deliberately putting his people as fodder for this horrible terrorist war that they’re conducting against us. So this has to stop. And I think many people in Gaza understand that Hamas is destroying Gaza, destroying their lives. Netanyahu speaks on the phone with Abbas, for the first time since the abduction, asking Abbas to help bring the incident to a conclusion. Netanyahu places responsibility on Abu Mazen for helping to find the missing boys, since the kidnappers come from and escaped to Palestinian controlled territories. The terrorists kidnapped innocent Israeli children, while we take care of in our hospitals sick Palestinian children. This is the difference between our humane policies and the murderous terrorists that attack us. There is no moment that can compare to the intensity of shock and suffering, and we know that the wound never fully heals. Benjamin Netanyahu is born in Tel Aviv, Israel, growing up in Jerusalem then Philadelphia, Pennsylvania. 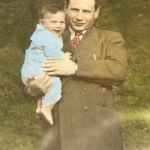 His father, Jewish historian Benzion Netanyahu, works as a professor. His mother is a stay-at-home mother. He goes to Cheltenham High School in Cheltenham, Philadelphia. You taught me, Father, how to correctly view reality, how to understand what it contains within it and draw the necessary conclusions. It certainly wasn’t an easy thing for you, because there were always those who did not see as you did, ridiculed, laughed at or belittled your conclusions. But I believe that in this, as well, you taught me to distinguish between the important and the unimportant, and concentrate on the important.